Many of us have carried this “destination impatience” forward into adulthood. When we’re in school, we can’t wait to graduate. When we graduate, we can’t wait to work. When we work, we can’t wait to work somewhere else, find a different line of work or retire. Sound familiar? We feel impatient because we convince ourselves that once we reach the next destination (whether it’s a new career, a different relationship, more money, a “better” body), we’ll finally be content. Trouble is, once we arrive at that destination, we’re often not satisfied with where we are; it seems like there is always another destination to journey toward. In addition to our dissatisfaction, we may also feel remorse about the things we miss from the past. But, how do you do that? How do you enjoy the journey and stop putting your happiness on hold? There are several strategies. Here’s one you can focus on in this very moment: Appreciate what you already have. Rather than focusing on the abundance to be gained tomorrow, focus on the abundance you already possess. Counting your blessings is a great way to shift your focus from some hazy future destination back to where you are in your life at this very moment. This doesn’t mean you abandon your goals and dreams. Striving to achieve goals and fulfill dreams is a crucial component to living a joy-filled life. It does mean, however, that while you’re going after what you want, you allow yourself the happiness, satisfaction, and inner peace derived from appreciating all that you already have. What is it that you must do differently to be happy now? Are you willing to keep putting your happiness on hold? 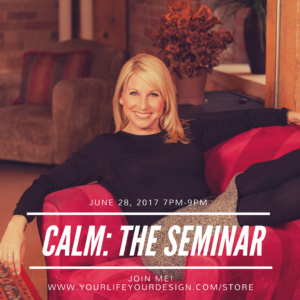 Join me at the Ajax Convention Centre on June 28, 2017, from 7:00pm to 9:00pm at CALM: The Seminar to learn more strategies to infuse happiness, joy, and inner peace into your life today so you can truly enjoy the journey! AND so much more! This is a game-changer! Early bird registration ends soon . . . register today! Click here! AND . . . Tonight when you go to sleep, count your blessings instead of sheep. It will go a long way in helping you to be happy with what you have while you pursue all that you want.